Hiring Trends 2018: What’s Ahead for Staffing Firms? 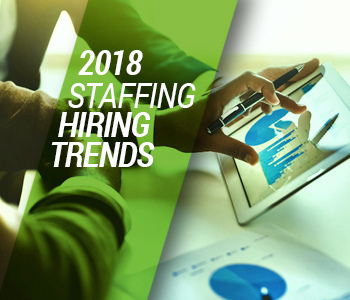 Staffing firms plan for yet another year of growth in 2018. As a staffing professional, you’re a master juggler. Keep in touch with clients? Check. Reach out to new clients? Check. Reach out to prospects? Manage responses? Check. And the list goes on. Meanwhile, the paperwork is piling up, phone calls go unanswered—and oh, wait for it—here comes a New Year, just as you were getting your head around 2017 staffing trends. Are you ready? Worry not. We’re here to help you forge fearlessly into 2018, armed with the insights from top industry experts. Their expertise points to two key upcoming areas of concern for staffing in the year ahead: a tight labor supply, and uncertainty about how government policy will affect business. Yet the stretched labor supply is likely to present an even steeper challenge in the New Year than it has in 2017. With unemployment as low as it is, it will be a challenge to find the right talent. “Over the past two years some of our member firms have had more open requisitions than at any other time in their history,” says Richard Wahlquist, CEO of the American Staffing Association, a lobby group. “This is the number one ‘up-at-night’ issue,” along with filling staffing firms’ pipeline for internal employees, he says. Take a few minutes to familiarize yourself with the key trends below and boost your 2018 confidence index. Higher churn rates may be a boon to staffing. “In 2018 we expect to see a continued imbalance between a tight labor supply and fairly robust demand,” says Patrick Beharelle, CEO of TrueBlue. “And with such low unemployment, you tend to see more churn.” Such churn can increase demand for temporary or temporary-to-permanent employees as clients scramble to fill in for departing workers. A tight talent pool could constrain staffing expansion in 2018. With unemployment near 4 percent as 2017 winds down, the talent supply is a critical concern for the staffing industry. “Shortages are making it harder for staffing firms to grow,” says Asin. Industry experience can be an effective draw for talent. Whereas the training of contingent workers was once mainly about learning the tasks of a specific job, it’s now more about learning the industry and its software. Many candidates seek that training. Wise staffing firms will keep a closer eye on city and state regs. The White House administration is seeking a major rollback of regulation, so labor advocates are evolving their strategy. Given labor unions’ traditional Democratic affiliation and that the party is out of power in Congress and the White House, labor organizations are bringing their regulatory advocacy to select cities and states instead, Wahlquist says. Staffing firms need to carefully monitor changes in state and local regulations for 2018. Workers from around the world are still a key resource. Although immigration will continue to be a hot-button issue in 2018, clients are not shying away from using international professionals.